Important Artifacts and Personal Property from the Collection of Lenore Doolan and Harold Morris: Including Books, Street Fashion and Jewelry by Leanne Shapton, which is a novel in the form of an auction catalogue, and a book I really want to read. I loved Boy in the Striped Pyjamas and I’m pleased to come across another blogger who’s read The Evolution of Inanimate Objects by Harry Karlinsky – such a curious little book! The auction catalogue novel sounds intriguing… I still need to read Evie Wyld’s first novel. Those are great links. Time’s Arrow sounds really interesting – I recently saw Martin Amis interviewed and he was such an interesting and funny man. Thanks for joining the meme. Thanks for your comments, folks! Beth: I’m curious, what would your reason have been for linking The Luminaries with Evie Wyld? Kate: Have you seen that Karlinsky has a new book out, The Stonehenge Letters? It’s in a similar vein to the first one. Orangepeko: Yes, do read Wyld’s first book – it’s excellent. 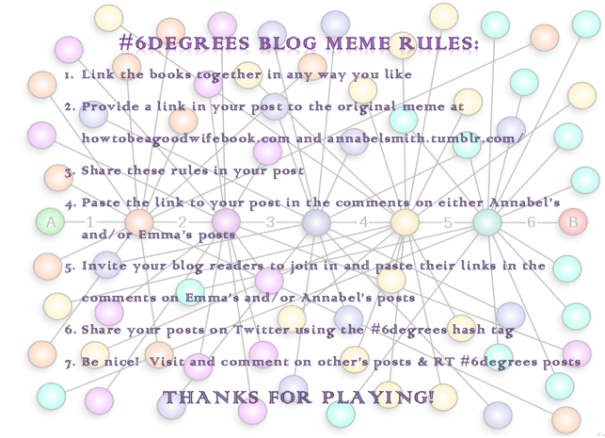 Annabel: I picked up a copy of Time’s Arrow when it was a choice for my book group; but I never got around to reading it, so I can’t say whether it’s any good… I’ll be doing #6Degrees again next month, though! Great to hear, I’m glad you’re enjoying it.